Nautilus Minerals Limited has been granted a two-year exploration licence to conduct exploration activities on this area within the southeast Bismarck Sea. The company announced on Thursday (Feb 8th) that the Government granted to Nautilus EL2537, which covers 2,558 km2, including the same prospective geology that hosts the Solwara 1 deposit. 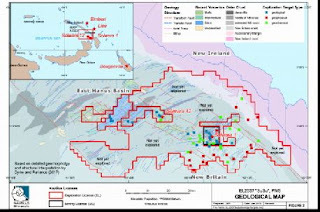 The company says the area was selected based on reconnaissance sampling and survey completed in 2017 and acknowledged the assistance in this area by the PNG Geological Survey. Nautilus CEO, Mike Johnston, said: “The granting of this Exploration Licence is excellent news. “Work done in the area by the Company has identified numerous exploration targets with similar geology to our seafloor massive sulfide deposits found at Solwara 1. “The work completed last year reconfirms the significant exploration potential for deep sea minerals over expansive yet unexplored metallogenic provinces. The company said subject to receiving additional funding under their previously announced bridge loans and potential credit facility transaction, Nautilus aims to test and progress these targets as soon as practicable. This is to advance the Company's plans of increasing its current resource portfolio to support future seafloor mining operations. 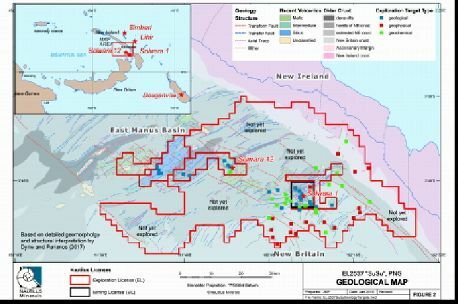 “PNG is renowned for hosting large mineral deposits and the same tectonics that drive mineralization at the nearby Bougainville and Lihir deposits, is also believed to drive seafloor mineralisation at Solwara 1 and 12, placing this exploration licence in a favorable location. On Thursday, Nautilus announced that to date, the Company has received bridge loans from Deep Sea Mining Finance Limited totaling US$4,750,000. The bridge loans, which Nautilus expects to be in the aggregate amount of up to US$7 million, will assist the company’s immediate working capital requirements and facilitate payments required to continue the development of the Company's seafloor production system, to be first utilized at the Company's Solwara 1 Project.